Various social events including our summer barbecue and annual Awards Presentation evening where we present awards to club members who have been shortlisted and then voted upon by fellow club members. There are a number of running award categories and special awards. Participation in the Round Norfolk Relay. 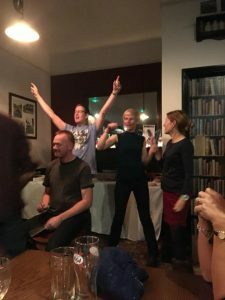 A unique club experience of a 24 hour continuous relay outlining the Norfolk/Suffolk border in 17 unequal stages. The total relay distance is 197 miles. The Relay brings together the club to work as a team and really enjoys club camaraderie and support. Wymondham AC also organises two races per year: the popular New Years Day 10k and the Wymondham 20 miler held in March. A great preparation race for anyone taking part in Spring marathons or other long distance events.